It's spring in Suwon of South Korea in April. The spring rain was drizzling day and night. The chilly wind was blowing ceaselessly. I misconceived that cold winter still hanging out around Suwon. Situated at south of Seoul, Suwon is 44 km away from Seoul. There are few options of getting to Suwon. 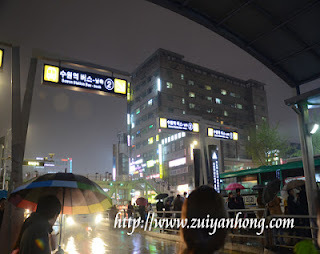 You can go to Suwon by bus, taxi or train. It takes about 50 minutes to travel from Seoul to Suwon. UK Premier League player, Park Ji-Sung was born and grown up in Suwon. A city street was named after Park Ji-Sung in 2005. Suwon is also the production base, research and development center of South Korean gigantic electronics company, Samsung Electronics. Suwon has a number of scenic spots and historical relics include Seoho, Paldalmun, Hwahongmun, Suwon Hyanggyo, Hwaseong Fortress, Suwon Folk Village, Hwaseong Haenggung and Suwon World Cup Stadium. Hwaseong Fortress is listed as a UNESCO World Heritage Site. We stayed in Suwon for two nights. After that we moved to Seoul for viewing Cherry blossom in Yeouido Hangang Park. You can go to South Korea anytime. Just buy a flight ticket and fly to South Korea. niat hati nak ke korea...apakan daya kaki tak sampai...he..he..
Daya kaki tak sampai, tak apa. Senang saja, boleh terbang.